Cheap eats abound in Brixton Village Market these days, and Okan delivers on this front. 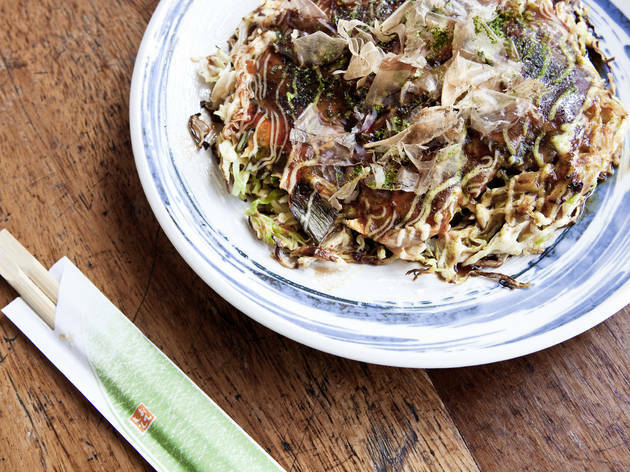 Specialising in the Osaka street-food staple, okonomiyaki, the menu may be small, but it’s perfectly rounded – fried noodles, edamame, a little grilled aubergine and the all-important Osaka-yaki, all included. As the name suggests (okonomi means ‘as you like it’), you can put pretty much anything into your batter mix, but pork, squid or kimchi are popular choices. A veggie-friendly combination of cheese, sweetcorn and rice cakes (mochi) made for an enjoyably chewy texture and plenty of flavour, though it got harder to pinch bits off with our chopsticks as the stuffed pancake hardened. Yakisoba, with slivers of pork and pickled ginger (benishoga), was perfectly al dente and filling, though less tangy from worcestershire-style sauce than usual. The thrill of an okonomiyaki restaurant often comes from watching the pancake cook before your eyes, but not here – there aren’t the facilities. Nevertheless, Okan is still a lot of fun. Much of the seating is on ‘outside’ benches, so you’re always in the thick of it in the vibrant market. Grab a beer and watch the world go by. Fantastic king prawn okonomiyaki: chock full of prawn, huge size and drenched with Worcestershire sauce. Amazing flavors: salty, sweet and I’m between. I got it for takeaway and it was just as delicious at home. Make sure to have plenty of napkins as it’s messy! I went around 5pm/5:30pm on a Friday and it was quiet; later and on the weekends it’s slammed. They DO accept card so not sure why the description says cash only. I don't know what happened to me on this visit, because the place has clearly got rave reviews. However I went on a chilly weekday for lunch and was really disappointed. The place was freezing and the waiter was a cool as the temperature and completely ditsy when it came to taking my order, seemingly completely unable to answer my simply question about whether the stock was vegetarian or not. I order a Prawn Soba soup and received a bowl with Udon noodles, in miso broth, approximately one spring onion chopped off and one friend king prawn lighting on top in a wet breaded crust. For this I paid £9, which is plain crazy. Sadly I won't be trying this place again as nothing about it impressed me. Happiness is.. sitting outside Okan in Brixton Village, drinking hot sake with friends. I’ve longed to try this place out ever since I discovered the joys of Brixton Village. Every time it has been packed out. I finally got a table because we came out at 21.30. I can understand why it is so popular. 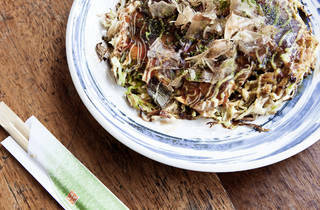 Okonomiyaki without the noodles is like Japanese bubble and squeak. The Special has prawns, squid, kimchi and sweet corn. It is so good – crispy, but so filling. We also had the aubergine starter, which was rich and tasty. Plus it's such great value for money. The staff are so friendly, our waitress sat with us like an old friend whilst she took our order. 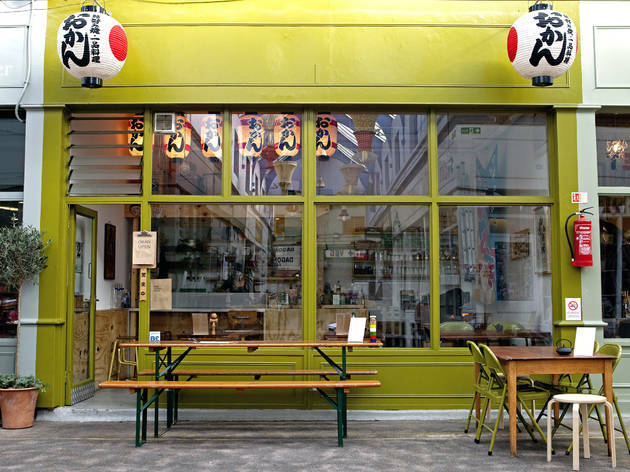 You need to try out this dinky Japanese eatery. Amongst the hustle and bustle of the iconic Brixton Market, it can be quite difficult to choose between all the smells and sounds coming from the variety of street food/pop up havens which adorn the alleys. However, for a guaranteed delicious and purse friendly meal, I cannot recommend Okan enough. 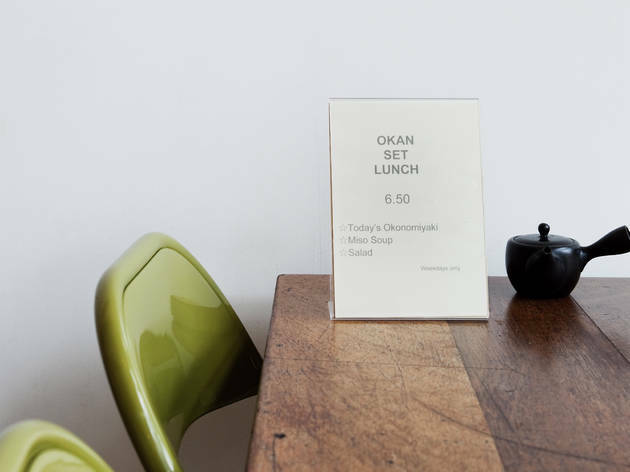 Okan is small, with a few tables inside and a couple outside, with blankets and candles to give you a cosy feel. 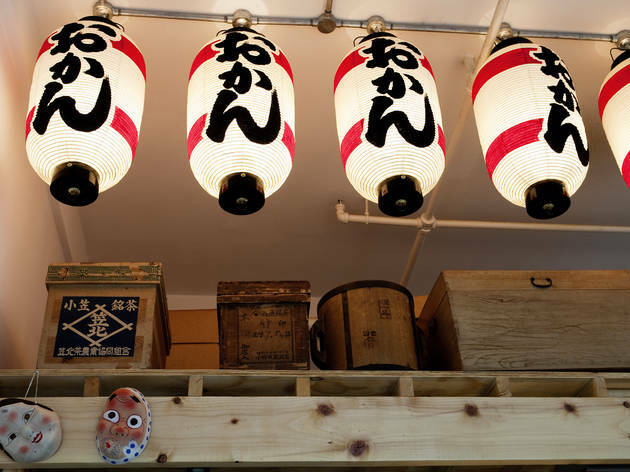 Yet, the décor isn’t really the focus at this Japanese eatery; their okonomiyaki (the signature dish), which is a staple in the Osaka street food scene, is incredible. If you have never tasted this dish before, it is quite hard to explain. They describe it as a savoury pancake, however it is more like a caramelised thick omelette, filled with a range of ingredients of your choice. The pork and kimchee combination is tried and tested- the bacon is cooked on the bottom of the skillet so is salty, golden and delicious. 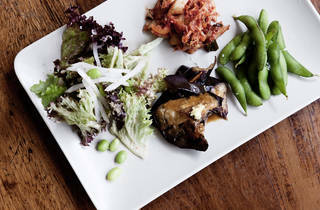 The kimchee is powerful and adds a great tang to the overall dish. The dish is finished with brown sauce and Japanese mayonnaise, adding a whole other depth of flavour, along with green seaweed flakes and bonito fish flakes which add a welcome crunch to the texture. One of the more bizarre dishes I have tried in London, but definitely one of the tastiest- packed full of flavour, okonomiyaki is warming and comforting and Okan is nailing it. The tofu gyoza we had to start were also divine- the tofu was tasty rather than bland and the dumplings themselves were light, delicate yet had a satisfying crunch. 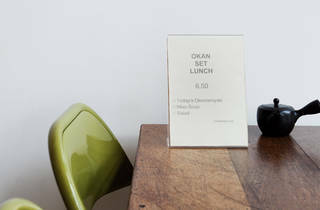 A two-course meal for two, with a glass of their refreshing house wine, came to a measly £30, so if you want to a full and satisfied stomach for the price of a gin and tonic uptown, head to Okan. Another jewel in the glittering and delicious crown that is Brixton Village Market. Authentic atmosphere and wonderful food! I had never tasted an okonomiyaki before and this place seems to be one of the best on that. It´s really tasty, full of flavour. After having been there, I tried another restaurant and it wasn´t the same thing, so that´s the place to go! The waiters are very friendly. I've had the fortune of eating Okonomiyaki in Japan and have been on the hunt for it in London ever since. Finally made the time to come down to Okan in Brixton and was thrilled with their food! Japanese style pancakes filled with ingredients of your choice, I opted for the more non-traditional Okan special which includes kimchee and sweetcorn. Great taste and loved to see the sauces all covered on top! 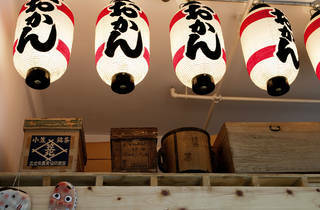 The service was polite, friendly and fast and they offer hot sake which sealed the deal! Only things to improve it for me would be if you could actually see them cooking the okonomiyaki and then pour on the sauces yourself - but the food itself is brilliant and some of the most authentic I've had since Japan! Top tip - they offer a lunch menu if you can find the time to get here! Hearty meals and cheery, friendly staff make this a great place to head to in the village, especially if you've never tried okonomiyaki before! The only thing that could improve it is eating it off a hot plate or surface as some places in Japan allow, but you'll probably be eating it too quickly for it to cool down anyway! Hands down our favourite place to eat. Amazing. Oishi! If you like Japanese food you have to try Osaka street food, and theres no better place to go than Okan. Been meaning to go to Okan for a while now, and it was pretty rammed when we got there (about 7.30pm on a Wednesday) - just a tribute to how popular and decent the food is. Im a fan of Japanese food, but had never tried the okonomiyaki - I did wonder if this was going to be a thin pancake, but this was actually more like a thick omelette - similar to the Korean Pajeon. I tried out the pork and kimchi - and WOW there's a LOT of flavours going on in your noisemaker when you have a bite. We sat outside on a random table, I dont know if it even belonged to Okan, but a few other diners ended up doing the same.Was a bit nippy sat outside, and much as I love the Village, and hate sounding like a my mother, remember to wrap up. Great value for money - the miso soup is a gem too! This tiny Japanese restaurant is a real surprise! 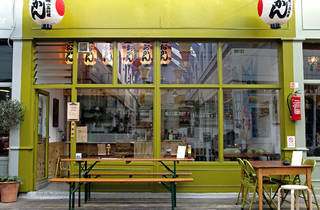 It's queky setting in vibrant Brixton Village doesn't say enough about the great food it serves. I would definitely suggest the 'pancake' in the picture above, which is more like an omelette filled with sweet and spicy Japanese flavours. Don't miss it! 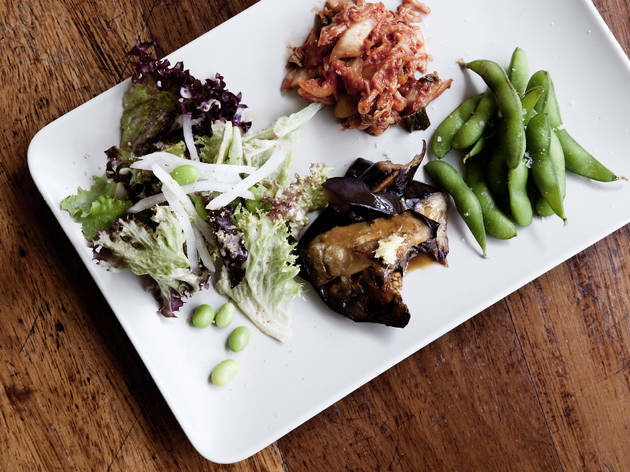 Okan is easily one of the best - and friendliest - places to eat in Brixton Village. If you've never visited, the Okan Special is a good place to start - a savoury pancake (okonomiyaki) packed with seafood, kimchi etc, with extra noodles if you're feeling greedy. The Yaki Udon is another good'un, and the wine is decently priced (compared to other spots in the Village). The service is super-efficient and the staff are lovely - and will happily explain the okonomiyaki recipe for you to attempt at home! A brilliant place for cheap eats - and far less busy than most of the 'big names' in the Village and Market Row. I head straight to Okan when I have friends in town - it's one of my favourite spots in Brixton Market. I love the fact that the service is quick which means even if there's a queue you'll still get a seat without much of a wait. Order the Okan Special okonomiyaki - a savoury pancake with pretty much everything thrown in (ok: squid, kimchi and sweetcorn to be precise). It packs a serious flavour punch. Brixton Village Markets is exploding with little gems! This is one of it's most precious! Highly recommended! Been to Osaka many times, been to the okonomiyaki building in Hiroshima - all I can say is that I love Okan and it feels like a little piece of Osaka right in the middle of London. Highly recommended, wonderfully tasty and totally original Kansai feeling. If your looking to try something new in the market this place is worth a punt. I have not eaten this style of Japanese street food before so have no comparative yardstick but. it's dishes have an artistic presentation, an unusual combination of flavours and I thought it to be delicious, my 3 year old too. Value was very good. Well worth a visit if you're regular to the market and looking for a quick, tasty and good value offering. Staff very friendly, they aren't child unfriendly but they don't have high chairs, no bother for us though. Probably one of the best things ive ever eaten! had the pork with kimchi and noodle topping - amazing! Make sure you bring wine - only £1 corkage! Okonomiyaki is the most populor food in Osaka where I come from. this little restaurant presents the tast of Osaka(very famous for nice meals) perfectly. I must go at least twice a week! Totally amazing!! Best okonomiyaki in London, love it. Best okonomiyaki in London! In an awesome location! Highly recommended! Went here with my parents and girlfriend. Everyone enjoyed it very much - food was delicious, we even ordered an additional dish to share at the end!